This organically grown purple basil plants come in reusable bamboo pots. Basil likes sun, however, they need to be protected from heavy rain or wind. Beautiful lilac flowers with dark red stems. Excellent contrast with green basil. 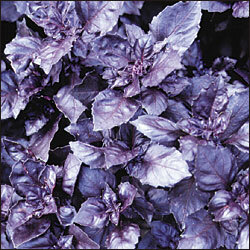 Spectacular as a garnish, in salads, or for adding color to basil vinegars. Very uniform, all purple Italian strain.